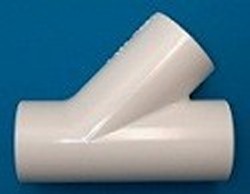 PVC-3/4" Wye Full Flow Wye. (can use any port for input). Approx. 45° angle. Sch 40 Made in the U.S.A.
PVC-3/4" Wye Full Flow Wye. (can use any port for input). Approx. 45° angle. Sch 40. Imported Fitting. Imported, Made in China, fully NSF-PW (61) and IAPMO rated.